The first recorded owner of a house on the site of ‘The Node’ was John Brocket, who lived there in 1638, after which it passed through several hands until it was purchased by William Reid – a partner in the giant brewing firm of Watney, Combe and Reid – in 1849. Charles Alexander Nall-Cain – a millionaire brewer from Liverpool – purchased it in the early 1900s. He later became the first Lord Brocket – which indicates that he might have taken this name from John Brocket. 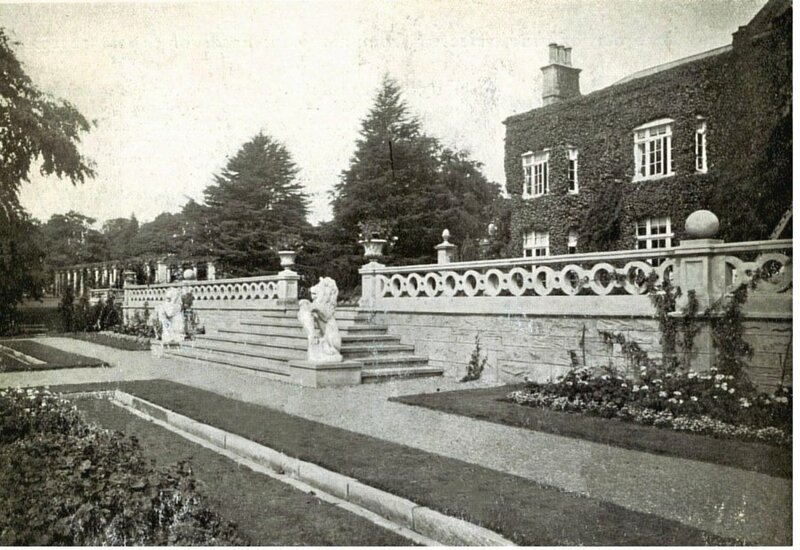 Nall-Cain commissioned James Pulham and Son to construct the Terrace Garden and the Sunken Garden adjacent to the house, and the water gardens and rock garden beyond that are reached via a classic Pulham rose pergola. Carl Holmes, a wealthy American, bought the estate in 1926, and invested lavishly in improving and enhancing the estate even further. The Pulhams returned to create two large artificial interconnecting lakes beyond the Sunken Garden, and ‘The Dell’, just beyond the Rock Garden near the rear boundary of the property. They also constructed a Japanese Garden and an archway folly near the boundary, but these – together with the two lakes – have since been sold off. They still exist, albeit in a rather sad, overgrown condition. There is also a very unique structure in what used to be William Reid’s Kitchen Garden. It is a Peach House that was designed by Joseph Paxton for the Great Exhibition in 1851, and Reid is believed to have been bought it for his home at ‘The Node’. It is not known whether or not the Pulhams were involved in its move and reconstruction. A full description of the work done by James Pulham and Son at ‘The Node’ – together with a number of pictures – can be found in Chapter 34 of Rock Landscapes: The Pulham Legacy – the critically-acclaimed and lavishly illustrated definitive story of the lives and work of James Pulham and Son. Written by Claude Hitching, with featured photography by Jenny Lilly. Published by Garden Art Press. Posted on October 7, 2014 June 30, 2016 by Claude HitchingPosted in Book ContentsTagged 'The Node' - Welwyn, . . James Pulham and Son, balustraded terrace, Carl Holmes, Charles Alexander Nall-Cain - Lord Brocket, Claude Hitching, japanese garden, John Brocket, joseph paxton, Peach House, rock garden, Rock Landscapes: The Pulham Legacy, Sunken Garden, Water Gardens, William Reid. site every day, because it provides feature contents, thanks!